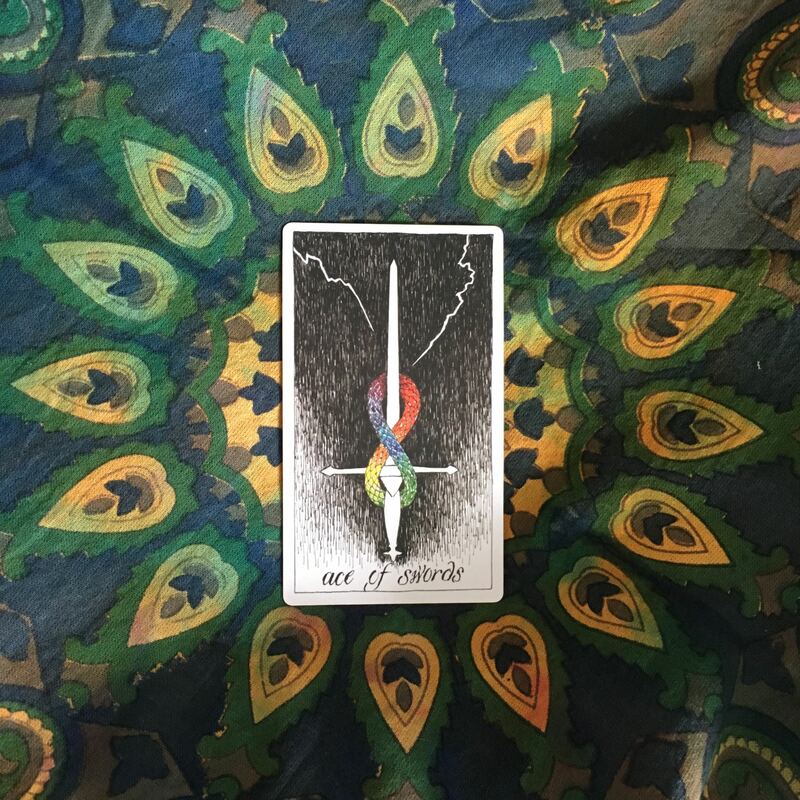 The Ace of Swords comes with a breakthrough of mental clarity – you know what needs to be done. But, as Michelle Tea puts it in her excellent Modern Tarot, this is a ‘mentally rigorous’ card, one that points toward justice or making a decision of right vs. wrong. 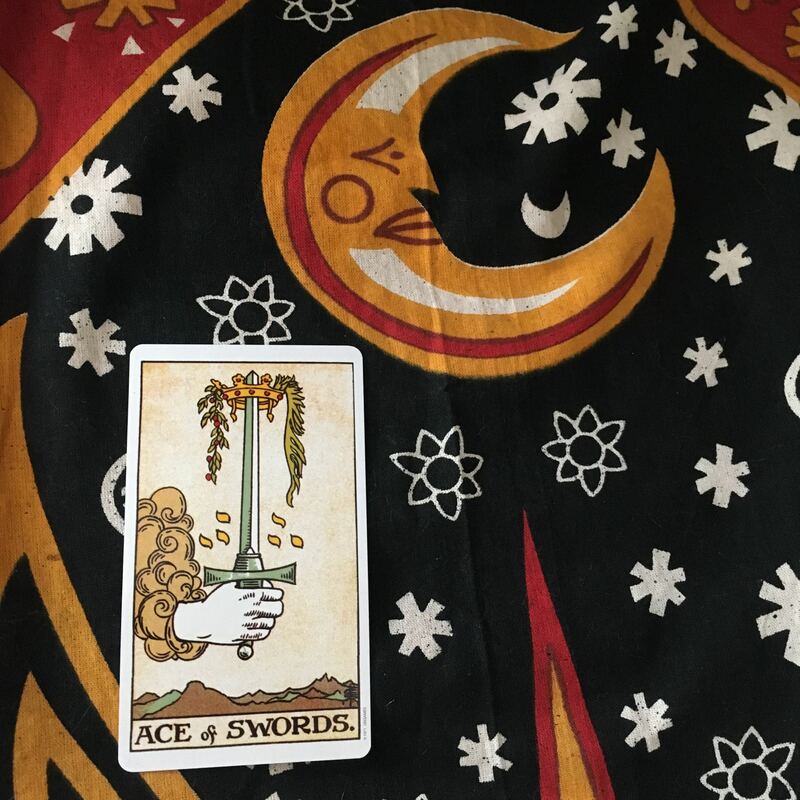 You may not like the work that has to be done, but the auspicious Ace of Swords says it’s time to do it – it’s time to make your stand and do what’s right (for you, for someone else, for your work, for your relationships). While you may be bringing unwelcome conflict into your life, you can rest knowing you’ll feel relief in making the right choice. You’ll develop character; you’ll build strength. 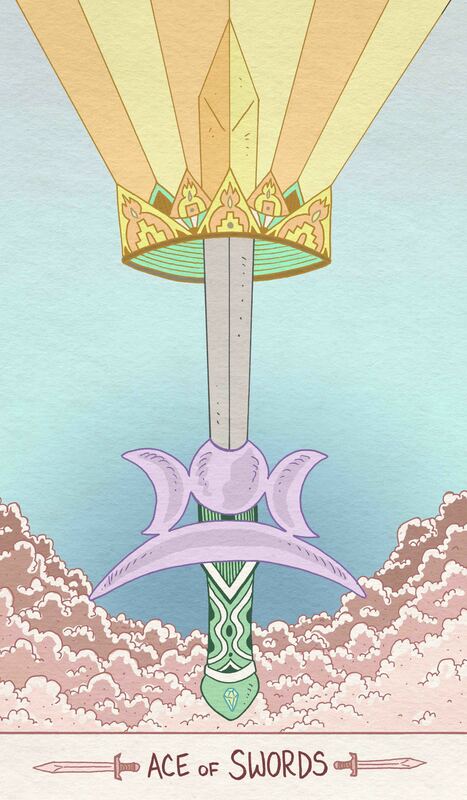 In The Luna Sol Tarot, Mike Medaglia has taken the traditional themes of the Ace of Swords. You can see the sword floating in the air, as if part of the clouds. The crown shines light, indicating clarity and victory. But Mike brings a certain warmth to the card – it just feels more positive than the RWS version, with its barren mountainous landscape indicating cold intellect. Here, the sword rises above in a victorious manner. It’s almost as if it has been pulled out of a stone and its power is radiating outwards. Mike also adds beautiful detail to the hilt of the sword and the crown on top of it. Every space is adorned with patterns evoking fire and earth. A tiny diamond is embedded within the pommel. And the top of the hilt shows the thematic shape of the moon, which appears to be rising over a horizon. It’s a unique manifestation of a card that is rife for many varied interpretations! Mental clarity, breakthrough, power. You can see what you must do, and little can stand in your way. Thanks for stopping by! What are your favourite incarnations of the Ace of Swords? How do you feel about this card? Let us know what you think in the comments of find us on Instagram, Twitter and Facebook. If you’ve enjoyed Sarah‘s thoughts on the tarot and want more from her, you can read about her early days with the tarot here and her recent progress here.